A favorite pair of blue jeans is like having a really good friend, but when you can no longer wear those jeans, the friendship doesn't need to end. Transform those jeans into a purse and continue the memories. The jean pocket on the front of this simple purse project is perfect for a cellphone and the one on the inside will keep you organized. 1. Print the pattern for the jean purse body and lining. Click on the pattern image and print. If you have trouble printing the pattern, try these helpful tips. 2. 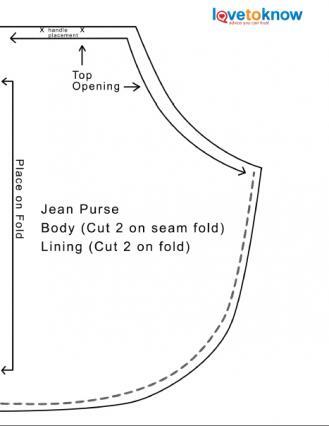 Pin the indicated fold edge of the pattern on the folded outer seam of one blue jean leg just above the hem. Cut out the shape. Pin the pattern above where the first piece was cut and repeat for a total of two body pieces. 3. Fold two layers of the lining fabric in half. Pin the pattern to the fold and cut out. You will have two lining pieces with one cut. 4. Cut two 3-inch-wide by 25-inch-long strips from the remaining leg for the handles. Cut one 1/2-inch-wide by 4 1/2-inch-long strip from the leg for the button loop. 5. Using a seam ripper, remove the two back pockets from the jeans. 6. Center and pin one pocket on one jean body, 3 inches below the top edge. Using matching thread, top stitch the pocket to the jean body. This is the purse front. Repeat with the remaining pocket on one lining piece. 7. Pin the two body pieces together with the wrong sides facing out. Sew the sides and the bottom of the body using a 1/4-inch seam allowance. Repeat with the lining pieces, leaving a 4-inch opening in the bottom. 8. Place one handle strip on your ironing surface with the wrong side facing up. Fold over one long edge 1/4 inch and press. Repeat on the other long edge. Fold the handle in half, matching the long edges and press. Pin the edge closed. Top stitch along both the pinned and the folded edge to finish the handle. Repeat with the remaining handle strip. 9. To prevent fraying, sew a zig zag stitch along the long edges of the button loop strip. 10. Turn the purse body right side out. Lay the body on your work surface. Pin the ends of one handle to the top edge where indicated on pattern. Bring the ends of the button loop strip together. Pin the ends to the center-top of the purse back. Flip the body over and pin the remaining handle to the front of the purse. 11. Do not turn the lining right side out. Insert the purse body into the lining. Match the top edges and pin. Sew around the pinned edge using a 1/4-inch seam allowance. Clip the corners and trim the seam to 1/8 inch to remove bulk. Turn the purse right side out through the opening in the lining's bottom seam. Press. 12. Top stitch around the purse opening 1/4 inch from the edge. 13. Sew a 5/8-inch shank button to the center-front of the purse, one inch from the top edge. 14. Hand sew the opening in the lining closed. Do not use the inner, flat-felled seam on the leg when cutting the purse body. The bulk is too thick and stiff for this pattern. When attaching the lining, it does not matter which side of the purse the inside pocket is placed on. Your button can be new or recycled, or you can purchase a button cover kit and cover the button with the jean or lining fabric. Cording or ribbon can be substituted for the denim button loop strip. This simple tutorial on Hoot Designs transforms a pair of jeans into a bootie bag purse. This purse takes advantage of the pre-sewn qualities above the legs. This Wipster tutorial provides a twist on the usual jean purse by using the jeans as the lining in a bow bag. Blue jeans offer a free, durable fabric that can be used for much more than purses. Pillows, aprons, stuffed animals and quilts are just a few frugal ideas that can be created with the recycled denim fabric.